This house was built for investment purposes around 1918, and the first residents were George and Anna Mergell. Mr. Mergell was a New Albany druggist, working at one time at the Yellow Front drug store at the northeast corner of East 8th and Oak Streets. He later operated the old Mayes Drug Co., “The Complete Drug Store,” on East Market Street in downtown New Albany. The Mergells were members of Holy Trinity Catholic Church and resided on 13th Street until the mid 1930s when the property was sold to the Martin N. Sillings family. Mr. Sillings and his wife Mary were the first owner-occupants of the home. Martin was a foreman of the cutting department at the Neptune Clothing Company in Louisville. He was also a member of the Floyd County Alcoholic Beverage Control Board. After the death of Mrs. Sillings in January 1953 at the age of 70, Martin moved next door at 416 with his son, Daniel. Daniel was the founder of the New Albany car dealership, Dan Sillings Buick. Martin passed at age 77 at the home of his daughter, Mrs. Frank Kraft, on Centralia Court in Clark County. 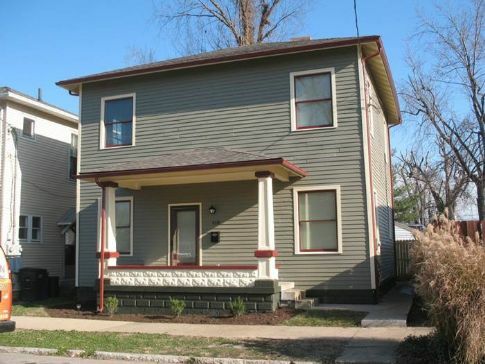 The house underwent a complete rehabilitation as part of the 'Midtown Renaissance' project in 2011. 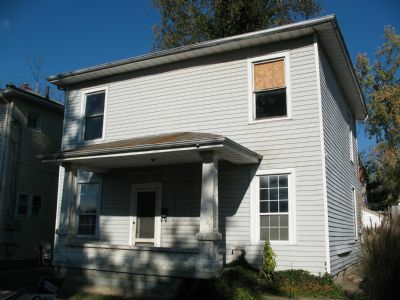 The photo below shows the house prior to rehab.